Whether it's a public or private groundwater supply, most drinking water sources require treatment or corrective measures to make water appropriate for drinking, cleaning or cooking. Contaminants in your water can cause staining of fixtures, corrosion and clogging of pipes or unpleasant tastes and odors. At Master Water Conditioning, we have made a significant investment in our water analysis lab. With over 50 years of experience testing and analyzing water from a wide range of water supplies across the Eastern United States, we have the knowledge and expertise to analyze your water quality and recommend the best treatment options. We offer free testing to all of our customers, whether its determining the quality of a newly drilled well or a newly installed system. It is important to follow a simple procedure when collecting a water sample for analysis. First, a sample form should be completely filled out by the individual collecting the sample. This form is provided at no cost with every sample bottle Master Water Conditioning provides and it is also available for download on our website. Without all of the information on the sheet, we will be unable to test or analyze the sample properly. For commercial and non-residential applications a commercial worksheet needs to be completed and sent in with the sample. It is important all of the information on the sheet is completely filled out to properly evaluate the complaints or issues the customer is experiencing. For example, knowing whether the water has a foul odor or taste, staining or rusting fixtures, mineral deposits are forming or whether pipes are corroding will provide insight as to what additional testing may be needed. A simple procedure is used to collect the water sample. Master Water Conditioning provides free sample bottles for testing. If you are unable to obtain one, a non-food/beverage container (i.e. spring water bottle) is an acceptable alternative. 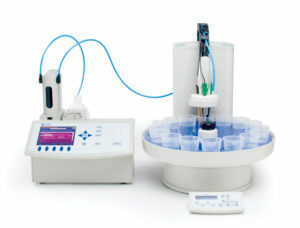 Any water sample received in a food/beverage container (i.e. sports drink/soda) will not be tested. 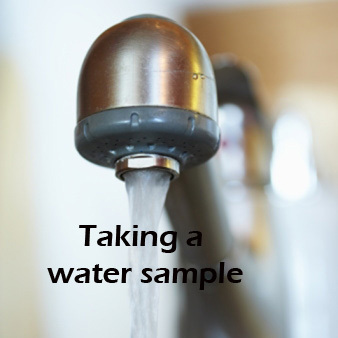 A raw water sample can be collected from any faucet in the home. However, any aerators should be removed before taking the sample. Allow the unfiltered water to run for 2-3 minutes before collecting the sample. This will help to flush any potential contaminants that may have concentrated in the system to be flushed. Fill the sample bottle to just below the lid and tighten the lid completely. Our water testing lab requires at least 100 mL of water for standard testing. Additional testing will require more water and should be discussed before sampling. Place the sample bottle and completed paperwork in the mailing tube and ship it to the address on the mailing tube. Ship the sample tube as soon as possible. Keep the sample cool if it needs to be held for an extended period of time. We recommend not using USPS, as it takes significantly longer than UPS and FedEx. Diagnosing whether a new or old treatment system is working properly will require the collection of two or more samples. We will need a raw unfiltered or untreated sample before treatment and a treated sample collected after the treatment system. Follow the same procedure from above for collecting each sample. Often, a raw unfiltered or untreated sample can be collected from a well tank or valve installed before the system. Some systems have a bypass valve that will allow you to shut out the system for collecting a sample. Collect a sample of the treated water after it has passed through the treatment system. Clearly label each sample bottle and be sure to note on the paperwork accordingly. Note: It is extremely important to know what specific equipment is installed, when it was last serviced, and what issues if any, the customer or home owner is experiencing. If the treated water passes through a multi-tank system (i.e. multi-media filter, neutralizer, softener, R.O. ), you will need to collect a sample after each point in the system to properly diagnose and analyze if a system is working properly. The more information we know about the system, the better we will be able to evaluate a treatment systems performance. We do not have the ability to test for all contaminants, so further assessment of the water may be required of an EPA Certified Lab. This could include testing for heavy metals, pesticides, radionuclides, pathogens or VOCs (Volatile Organic Compounds). Certified testing services are available from private laboratories as well as local and state public health agencies. Below are lists and links for Accredited and Certified Testing Laboratories for states in the Mid-Atlantic and New England. We can help determine what additional testing may be required and then make recommendations for treatment options. Private well owners should have their water quality tested annually by a certified lab for their own records. For public/city water users, a local water testing report should be available for free from your local municipality or water treatment plant. The results of your water testing will be provided to you with recommendations. Recommendations on treatment options or additional testing are dependent on the testing results. Water quality can change drastically from region to region and season to season. The results of your testing can be explained by your water quality specialist or click this link Water Testing Results Explained. For more information regarding drinking water standards, water treatment, and water facts, Get The Water Facts.